Former Heavyweight Champion of the World “Iron” Mike Tyson said it best: “Everyone has a plan until they get punched in the face”. It’s one thing to due your diligence in creating a solid, fact-based strategic plan but you have to be able to adapt to what the market throws at you without panic. But how exactly is that done? Number 3, that’s us. We can review your existing plan to help you make a major change based on “getting punched in the face” or keep you on track based on market responses and not reactionary panic. Contact us for details. At The Golding Group, we strive to be something different. There are too many tradition advertising agencies, PR firms and marketing groups doing great work in OKC area. We take a different, more creative approach to modern business communications using traditional techniques in new ways. There is no one right answer to business communications or creativity. Our approach is to avoid the most obvious route to success, but really dig deep to do something truly attention worthy and memorable. Examples of this attitude include #Dans100k twitter promotion, TimeCar promotional items and the award-winning MHACO cross platform campaign. Now we’re ready to do it again. The Golding Group has partnered with Scissortail Creative and Oklahoma Magazine to present 30 Days 30 Photos, an introspective of the defying moments in Oklahoma this year. With this event we intend to define 2012 in Oklahoma via 30 photographic portraits, the topics of which are chosen by the community, that are taken by 30 Oklahoma photographers. Nominations were open to the community from Tuesday, September 4th to Saturday, September 8th. Following nominations voting is now open to the community from Monday, September 10th to Friday, September 14th. After voting has closed and the 30 topics have been chosen 30 photographers will be dispatched to take one portrait each of the 30 items in 30 days. We hope you join us for the opening party on Nov. 30th and check out the special December issue of Oklahoma Magazine. If you want to know more about how The Golding Group can help you not only get outside the box but realizes there is no box at all, contact us for more information. Learn how to plan and execute a highly effective (and award winning) integrated campaign. “Overcoming Stigma” – You don’t get to talk about that very often. Discussion of For-Profit and Non-Profit marketing including differences and similarities. Learn all the angles of full campaign integration. Because it’s at a brewery, you can order a beer (maybe). How to harness the power of PR by staying on message. Did I mention this campaign has won a lot of awards? There will be a cool video section of the talk. How to get excited about research, planning and measurement. No teleprompter! What’s the worst that could happen? We hope to see you all there. 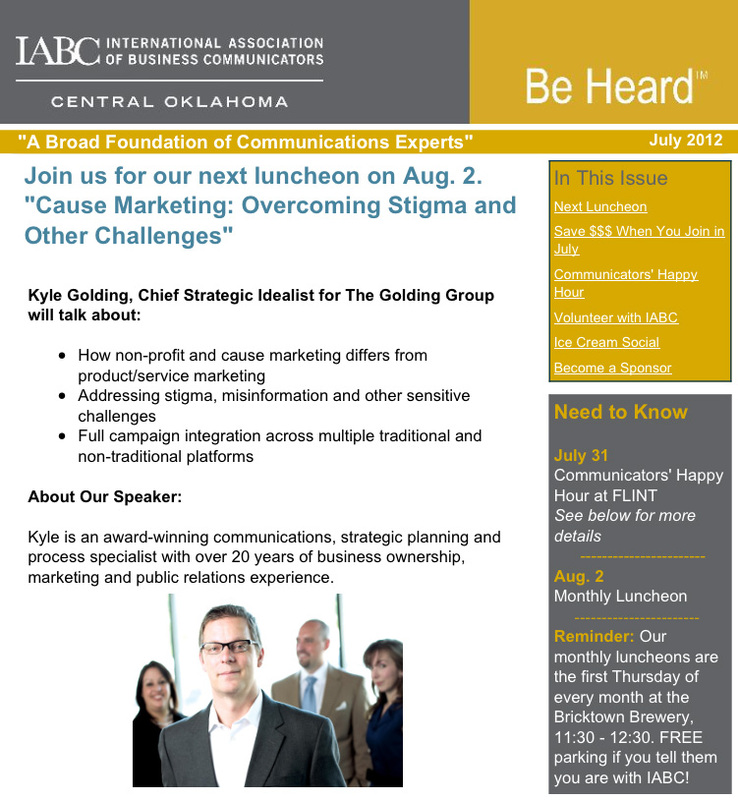 Thanks again to IABC OKC for the opportunity to talk about marketing with our peers. Samuel Gordon Jewelers Goes BIG! Anyone who knows Dan Gordon knows he has lot’s of great marketing ideas. Some are big, and others are really big. Dan asked us to work with TAG Watches to create something memorable for the superstore Samuel Gordon Jewelers location on N. Penn Ave. in Oklahoma City. Special thanks to Showtime Graphics for making our vision a reality. UPDATE: The MHACO Video has been awarded a bronze ADDY Award from the District 10 judging. This competition includes advertisers from Arkansas, Louisiana, Texas and Oklahoma. 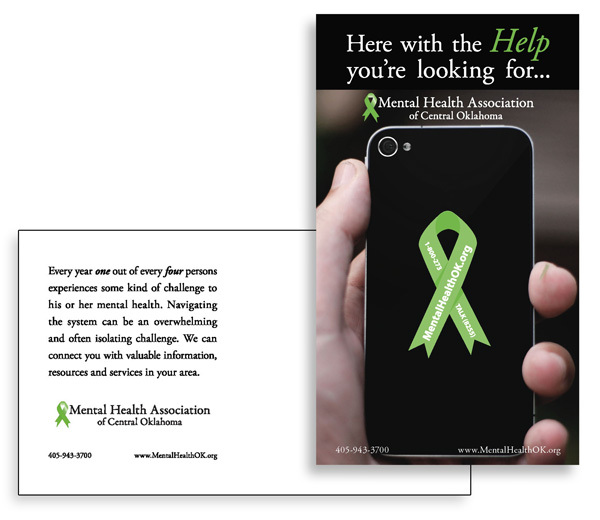 The Golding Group adds two new awards from the Oklahoma City Advertising Club with ADDY wins for projects we worked on with one of our favorite non-profit clients Mental Health Association of Central Oklahoma (MHACO). The Silver winner is a :30 sec. TV commercial conceptualized and directed by Kyle/Cher and produced by Midwest Media. The spot tackles the two most common problems the clients of MHACO have when needing support or information about mental health services: not knowing where to look -or- too many sources to know which is best for them. The Bronze winner is a direct marketing specialty (promotional) item conceptualized by Cher Golding, designed by Kyle Golding and produced by Robyn Promotions. It is a rubber “gripper” for the back of a cell phone to keep it from sliding off your dash or desk. The gripper os in the shape and color of the Mental Health ribbon and has the MHACO web address and national suicide hotline phone number on it. By keeping this information actually on the back of the phone, those in need of services can call or click for immediate help. The gripper card can be mailed or handed out at events. We are proud to be recognized for our creative work on these two project, but even more proud to create highly functioning tools for a great OKC non-profit organization. Both awards were the highest awarded for the category (no Golds were given). The Golding Group is proud and excited to announce that we are the official communications and business development provider for Rococo Restaurants (28th/Penn & Northpark Mall) and Catering. Rococo owner Bruce Rinehart and Golding Group partner Kyle Golding finalized plans this week for a partnership in continued growth of the Rococo brand. Rococo opened its doors at 28th/Penn in June of 2004 to much acclaim. After only 3 months of operations Rococo’s was voted “Best New Restaurant” by a reader’s poll for the Oklahoma Gazette. Last year, Rinehart opened a second Rococo located inside the Northpark Mall in Northwest Oklahoma City. Rococo also offers catering for weddings, corporate events and charity functions. For more information about the Rococo brand, visit their website.